SkiFree Game - Download and Play Free Version! Experience the simple fun that is SkiFree, a free skiing game that was originally packaged with early versions of Windows. Hit the slopes with the elementary gameplay that has made this title a classic of old style gaming. Make your way down the mountain and watch out for the Abominable Snow Monster! Upon opening up SkiFree, you will be taken right to the action at the top of the mountain. There are a couple of signs showing you the in-game controls, like F2 to restart and F3 to pause, but much of the game you'll have to figure out yourself. Fortunately, the controls are rather easy to use, with the option of using the mouse, numerical pad, or arrow keys to change the direction of your skier as he makes his way downhill. A little ways down hill from where you start, you will find three signs that show the types of skiing which you can do. 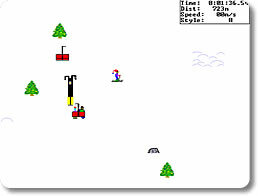 You can enter the Slalom Course (where you weave downhill through flags in the shortest possible time), Tree Slalom Course (which is just like the slalom just with trees instead), Free-Style Course (where you collect the most "style points" by doing flips, going over moguls, and the like), or don't enter any of the courses and just "ski free". SkiFree provides a relaxing and enjoyable time while testing your dexterity a bit as you wind your way down the mountain. There are a variety of ways which you can 'wipe out' as you ski downhill, such as crashing into trees, dogs, rocks, snow piles, snowboarders, other skiers, and ski lifts. You'll need some quick fingers and good eye-hand coordination if you want to make it down the mountain as fast as possible. SkiFree is great for those who might want a break from the other simple, free Windows games, like solitaire and minesweeper. It is great for short breaks since you can only complete one course at a time because, when you get close to the bottom of the mountain, the Abominable Snow Monster will rush out and eat your skier every time. So if you are looking for some simple skiing fun, grab your skis and download SkiFree today! Check out a clip from SkiFree, one of the great classics of Microsoft.